Spring Cleaning Sale! 50% off your 1st 3 months! When you first call our facility in Yorba Linda or Corona, you may not know what to expect. How do you know what size unit to rent? How do you pack to ensure that your stored possessions are as safe during the move from your location to ours as they will be during their time in one of our secure units? These worries are all too common. Luckily, the team at Allsize Storage has compiled some storage tips and tricks for your reference. 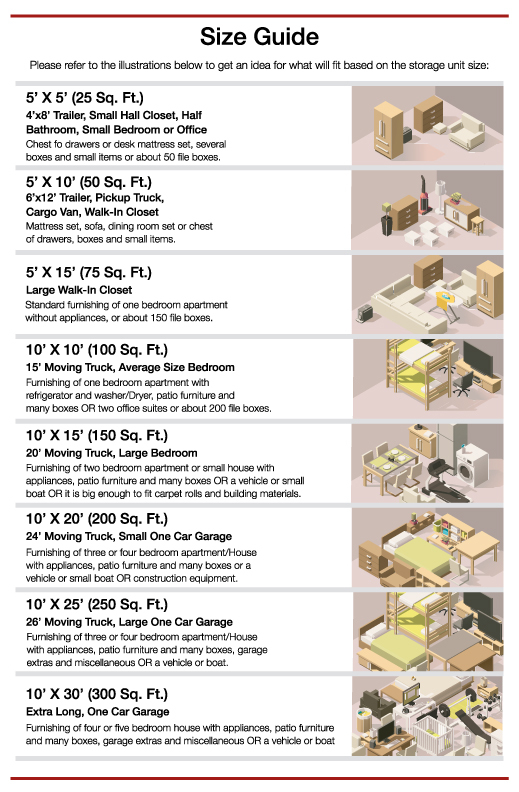 This handy guide will ensure that moving your possessions into your new storage unit goes as smoothly as possible for you and everyone involved. How do you choose a unit size? You will want to inspect your storage space. The space should be of adequate size to fit your needs. If you have any questions, refer to our Space Guide, or simply ask an Allsize Storage representative. Determine the packing accessories you need: bubble-wrap, tape, drop cloths, mattress and furniture covers, locks, and assorted size boxes from small ones for books to large ones for hanging clothes. Fill all your boxes to capacity. Partially full or bulking cartons may collapse or tip during your move. Heavy items like books or tools should be packed in small boxes so they are easy to lift. Protect your fragile goods with packing (i.e. bubble-wrap or other), and place them near the top of your storage space. Label boxes. Take home a list of labeled boxes for easy reference when you need to locate your goods. Leave air space around the perimeter to aid ventilation. This will help protect your belongings. Do not lean items against storage walls. Leave a walkway to the rear of your space for easy access. Use all the space available, including the height, and place frequently used goods near the door. Remember both of the facilities operated by Allsize Storage offer indoor and outdoor storage units in various sizes. Please call one of our locations to discuss the availability of the size unit you need, as well as the way you would like to access it. © 2019 Allsize Storage. All Rights Reserved.